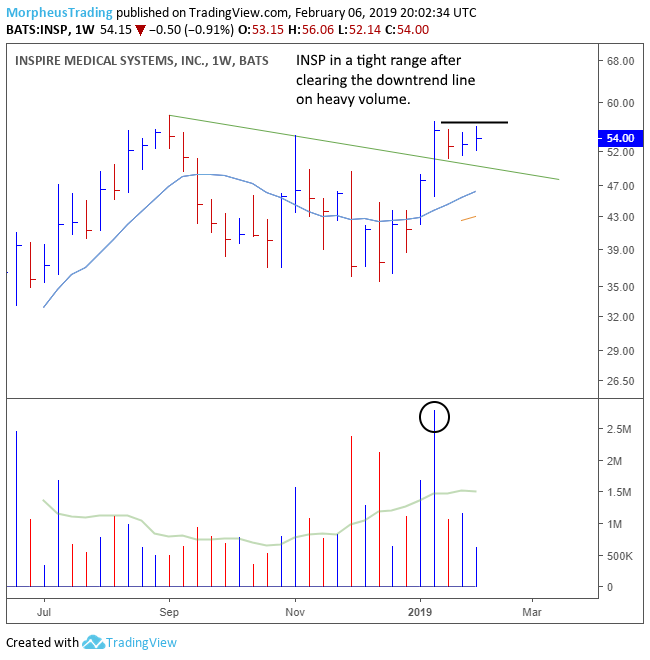 Inspire Medical Systems ($INSP) is a recent IPO (from May 2018) that is trading in a tight range on the weekly chart just below its all-time high. Note that volume was well above average when $INSP cleared resistance at $48 and closed above the downtrend line, which is a bullish sign. $INSP lacks earnings, but does have four quarters in a row of +80% revenue growth. A move through the highs of the current three week trading range is the obvious buy point, though the daily chart can be monitored for a lower entry on partial size with the idea of adding on strength. Look for a significant pick up in volume on the move out to confirm the technical pattern. 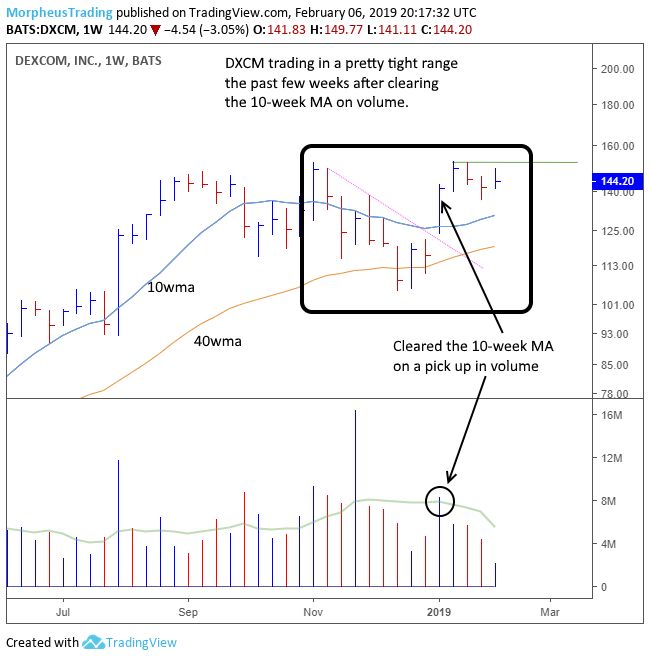 Dexcom ($DXCM) gapped above the downtrend line and the 10-week moving average on a pick up in volume a few weeks ago and has since been trading in a tight range. The current tight range is a handle (short term and tight consolidation), which should be monitored closely for a buy point. The obvious entry is over the recent swing high but an earlier entry could develop such as a break of the downtrend line connected from the high of 1/22 to 2/6. $DXCM also lacks earnings but has impressive revenue growth at +40% the past two quarters and over over eight quarters in a row of +20%. Freshpet ($FRPT) broke out to new all-time highs in 2018 after clearing the prior high at $26. The prior high was set in 2015 just a few months after its IPO in November 2014. Like the two setups above, $FRPT also cleared the downtrend line on a pick up in volume. 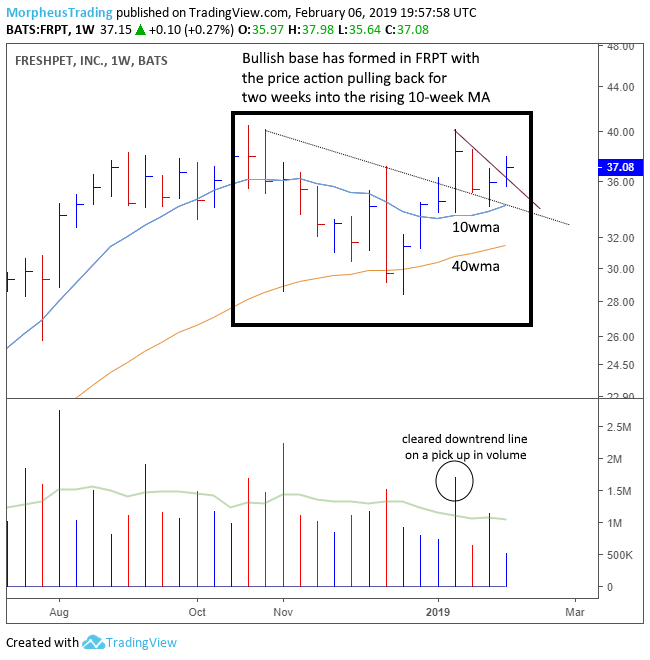 The pullback off the recent swing high is deeper in $FRPT than in $INSP or $DXCM, but the pullback did find support above the rising 10-week moving average. The price action surged above the short-term downtrend line this week, which is a positive sign if the price holds above $36. The analysis above is part of what we do in our nightly report The Wagner Daily, which is focused on small and midcap growth stocks that have explosive potential. For more in-depth market analysis – visit our website and sign up for The Wagner Daily today! Where Are Stocks Headed After Recent Market Volatility?